It's a crappy situation and you don't deserve to be stuck in it. Being an employee means agreeing to trade your labor for money. You bring a certain set of skills and experience to the table. You provide them to your employer for an agreed amount of time each week. And you receive money in return. The typical full time week is 40 hours. Sometimes a little less, rarely more. 40 hours is 5 x 8 hour work days, and two days off for the weekend (or two other days if you're a shift worker of some kind). The 8 hour day is well understood to be the maximum time that a worker will be effective at the job. Any hours beyond that have diminishing returns. Not necessarily in single instances, but a persistent trend of long days leads to decreased performance. The two day rest break is also well understood to be necessary for rest, recovery, and general well being. Your work-life balance depends on it. All the above is a business deal between you and your employer. In a business deal, if you are giving more, you should receive more in return. You can give a little more now, and get a little more later, but overall it should be a fair exchange of value. Imagine a painter hired to paint your employer's offices. The job should take five days, and the painter will get paid $5000 to cover materials, their time, and some profit. What do you think the painter is going to do in that situation? If they were like many IT professionals they would keep working through the weekend to finish the job. They'd work long hours, and work as fast as possible. And they wouldn't charge any more than the original $5000. The original $5000 deal allowed for $500 of paint, leaving $4500 for the 40 hours of painting work ($112.50/hr). Keep in mind that hourly rate covers the painter's salary and business overheads. The last minute change means $1000 in paint, leaving $4000 for 60+ hours of painting work ($66.67/hr). The painter took a $45/hr pay cut to do more work. And they gave up their weekend as well. Sure, the business thinks the painter is a hero for getting the job. The company can't say enough good things about how grateful they are. This amazing painter came through for them in their time of need. The next time they need a painter to work twice as hard for the same money they'll be sure to call him. But if the painter acts like the businessperson that he is, the price of the painting job will double to cover the extra materials and work required. The company will have to accept the higher cost, or hire another painter to get the job done. Either way the painter gets paid a fair amount for the work performed. So many IT professionals jump at the chance to be the hero, without thinking of the cost. …you're diluting your salary and devaluing yourself as a professional. Being an IT Hero costs you money. You're taking a pay cut to work harder. Who would agree to a one-sided deal like that? The painter knows better. He knows that giving away time and labour for free is no way to run a business. Both are lies. If you were that important you'd be getting paid a lot more. Yes, IT is critical to businesses. But businesses don't always align their investments with that reality. How many of you reading this are responsible for a critical business system that runs on old infrastructure, has no redundancy, and needs constant care and attention to keep it running? You've probably had many conversations with your employer about upgrading or replacing the system with something more reliable. But your requests get ignored, not because the business doesn't believe you, but because they've already paid for a solution. Only they didn't buy a technology solution. They hired an IT Hero to look after that broken system 24/7 instead. They take a similar approach to deciding on headcount for a team. Why hire another sysadmin if you can convince one IT hero to accept a 24/7, vacation-less existence taking care of things instead? And it's not that the business can't afford it. Businesses only survive if they're making a profit, or if they have enough cash to cover losses. What the business owners are actually saying is that they like how much money they're making, and don't want to make less money for the sake of making your daily life any easier. They're much happier to let you be an IT hero until the day you burn out, then hire another hero to replace you. Because you are replaceable. Employers are happy for you to feel irreplaceable if it keeps you acting like a hero. But you could literally die at your desk and they'd hire a replacement before the funeral is over. Sadly, employers will take everything from you that you're willing to give up. And not all companies care about their staff and promote a good work-life balance. I work 40 hours per week. Sometimes a little more, sometimes a little less. But 40 on average over a rolling 4 week period. Overtime is for pre-planned work, or critical incidents only. I will not work overtime to “catch up” on excessive workload. That's a problem that isn't solved by me burning myself out. Overtime gets compensated at a pre-agreed rate. Pre-planned work (e.g. projects) gets funded to include my monetary overtime compensation. Critical incidents can get compensated by paid time off. But I must be able to take the PTO without getting hassled about it or called for other matters. I take part in on-call rotations of at least four staff. Once per month is often enough to be on-call. I will not accept solo positions with permanent on-call expectations attached. On-call rotations get compensated as extra payments, not built-in to the salary package. This ensures flexibility with team members able to trade and swap on-call rotations with fair compensation. It also allows me to negotiate a base on-call allowance that covers the first few hours. Extra on-call load above that gets paid extra. When I'm on vacation, I am unreachable. It doesn't matter if I'm vacationing at home or hiking through the wilderness, I'm unreachable. If you can't survive without me, hire more staff or pay for an MSP to provide backup coverage. I'll play my part by implementing good systems and documenting them well. If those sound like unreasonable boundaries to you, that's fine. You're not the company for me. Knowing where I'll be a good fit and where I won't is a key part of my happiness. When you know what your boundaries are you can work out which jobs will allow for a good work-life balance. Your boundaries have little to do with the technical aspects of the job. How your skills match up, and what technology you want to work with, is a separate concern. Rather these are indicators of the quality of the workplace culture that you'll be stepping in to. Your boundaries form the basis for discussions during job interviews. I'm not saying you sit there and rattle off your boundaries like a list of demands. That will sound arrogant, even if the boundaries themselves are reasonable. Instead, I'm suggesting you use questions to work out whether a company aligns with your personal requirements. Here's some examples of questions I would ask a company that is interviewing me. That might reveal some info about a key system that recently went down. NowI get to ask them about the likely impact of that system on my work-life balance. I don't want to support that piece of crap. But maybe I would be willing to, if the work-life balance was still preserved. Job interviews are a two-way conversation. Use the opportunity to ask about the things that are important for you, so you know whether the company aligns with your boundaries. Being an IT hero has no value. It costs you money and burns you out. You're not “doing time in the trenches”, “learning the ropes”, or “gaining valuable experience”. Good jobs provide those things too. You don't need to sacrifice yourself to a crappy job just to earn industry cred. You should get treated well and get compensated fairly for your work. That means negotiating. Negotiation starts with knowing what you want, and knowing what you're willing to compromise on. Negotiating is much easier when you know what your boundaries are. Working after hours to support projects or perform changes? Let's talk about overtime payments, or paid time-off-in-lieu that you actually get to use. Let's talk about remote work and flexible hours so you can leave early, see your family, then log on later to do that planned task. Weekend work? Let's talk about scheduled days off during the week to recover, or an extra day added to your next vacation with the family. On-call rotations? Let's talk about a fuel/petrol allowance, mobile phone allowance, and on-call payments. Hint: you should be getting all of those things. No point getting compensated for using your phone but giving hours of your time away for free. And if you have to put your life on hold when on-call you deserve a payment for the inconvenience. The first time you have to leave a BBQ or a movie theatre to respond to a call, you'll understand what I mean. Negotiating your compensation package before you accept a job is crucial. After they've got you onboard there's far less room to get what you want. Asking is harmless. The worst that can happen is that an employer says no. Then you can make a decision based on your boundaries. What If You Have No Leverage? Negotiations are all about leverage and compromise. If you have no leverage, you need to compromise more. If you have all the leverage, you don't need to compromise at all. The job market is like any other. The economics of supply and demand are in play. If you are in a high demand area, with low supply of your skills, you have more leverage to negotiate. If you are in a low demand area with high supply, you have less leverage to negotiate. For those of you early in your career, you might simply feel that you don't have the skills to negotiate at all. This might be true, and I know how it feels to be at the mercy of whatever jobs and conditions are being offered to you. Here's the thing. You might need to just take a job so that you can have an income. There's no shame in that. I've done it more than once in my life. If that's where you're at, do your best to get a good outcome, but be ready to accept what's available. That doesn't mean you can't have boundaries. In fact, it makes your personal boundaries all the more important. Someone with no boundaries in a poor work situation will probably end up wondering why they're not “cut out” for this industry. What seemed like a great career choice has turned into a soul-sucking nightmare. But someone who knows their boundaries will immediately see the situation for what it is – a necessary compromise for survival. Take the job, earn a living, and keep working to build your skills and find better opportunities. What If They Lie to You? Employers usually don't lie to you during job interviews. Some do, but most won't. But, what most employers will do is allow you to lie to yourself. If you don't ask about overtime, or on-call, or remote work, the company can't get blamed when the reality turns out different to your expectations. That's why it's so important to use the interview to discover these things. When you do find that rare company that will outright lie to you, well then you've got a fight on your hands. You got promised paid training days, but nobody in your team has had one for six months. The after hours work keeps getting thrown at you, but you're required to cover a full shift the next day as well. The employer is reneging on the deal they gave you. You've already done the hard work to negotiate during the hiring process. Don't cave in now. Remember, they will take whatever you let them take. When you do get a good deal for yourself, and you're enjoying your work-life balance, you still need to remain vigilant. Expectations have a way of creeping in one direction or another. Let's say they need you to work late again, the third time this week. Side note: I use the “kids” examples because I'm a father. But it's also valid to say you want to go to the gym, play video games, or to give no reason at all. It's your personal life. Don't downplay it or apologise for it. Or you get approached on a Friday and asked to come in on yet another weekend. What about out of control on-call workloads? These are difficult conversations to have. In these situations the person who is least comfortable usually gives in so they can escape the conversation. You need to be ready to feel uncomfortable. When it feels uncomfortable, that's when you know you need to stand your ground. Don't let discomfort force you into a retreat. And don't get baited into becoming the IT Hero again. No, because we discussed all this during the interview. And reality is panning out different to what I got sold. Good for Steve. I'm not Steve. I have my own boundaries. And I'm not willing to give up my life the way Steve is. If it's busy then that means the company is making more money. So they can afford to compensate me better during this period. I'm sure the sales team is enjoying the extra bonuses right now. Why should I be the one diluting my value so the company profits are higher? Pay me a higher on-call rate during busy seasons, and we can reduce it again during the quiet times. Then they can feel some pain for their lack of planning. I bet they don't do that again for a while. Either that or they can kick in some extra budget to IT and you send me on that training course you've been promising me. If you play the IT Hero in those situations you're giving up something you value – your time. That will lead to you resenting the work that you're having to do. We shouldn't resent the work that is our profession. We should enjoy it. Enjoyable work is energising and fulfilling. Resenting our work leads to dissatisfaction and burnout. We hear the stories every day about IT professionals giving 100% of themselves to a company. Eventually they either burn out, or get replaced by an outside provider. In some sad cases, they end up with serious health problems that end their career. That's not very heroic if you ask me. You can be a hero in life without being an IT Hero. Be a hero to yourself, to your family, or to the community. Be proud of being a great parent, running a marathon, taking a beautiful photograph, or giving your time to a charity fundraiser. When you look back on your life, those are the things you will be be glad that you did. I can’t wait to put my hands on your book once it is released! Such a great article with lots of real-life advise! I love this article! Thank you Paul! Its 100% representative of the IT industry I work in, but I wont tolerate that sort of pressure from IT Management unless they compensate accordingly. Excellent article about real IT world. Exactly describibg the situation am in right now. You are a mind reader Sir Paul. Like it or not, you have effectively become MY new hero. Thank you, a million times over, for this insightful piece. The companies found the solution.. they just out sourcing IT.. Paying much less for more hours. That’s exact what we see in today’s IT industry…. Helpful article, as it let’s you know about your caliber and limits, and the extent we can fight during negotiations. Once upon a time men were working at home, women were working at home, both near to their children.. then everything changed cause wars and with industrial revolution. Now in IT industry we have a chance again to work remotely with cloud platforms or even remote desktops. I’ve been blessed with a remote work and it has been a great experience for me and my family. 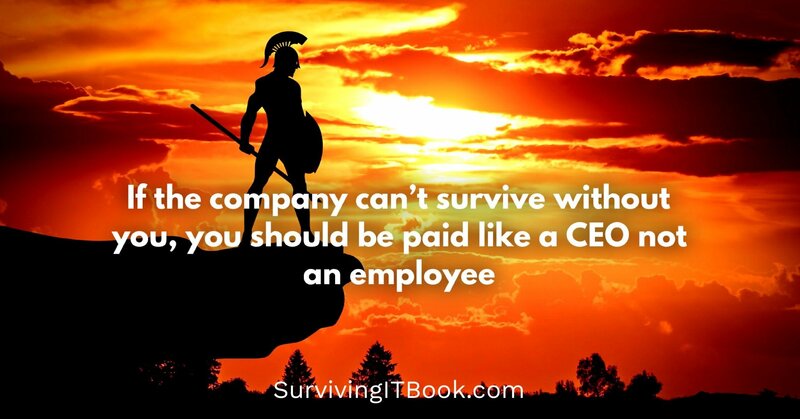 Too many employees have None. Too many do Not have the skills. Too many do Not have the ’emergency’ fund.